It was a good accent lamp with Nice modern shape that fits the corner of the room well. The height is not to tall. Heavy solid base, spend some time fitting the base, so do follow instructions (I am not very good at that, nothing complex though. The metal finish is glossy. It has a deeper yellow color. The top of the shade can be rotated to a full 360 view, so that is a very nice feature. The light bulb came with it, that has the right wattage for our family room. 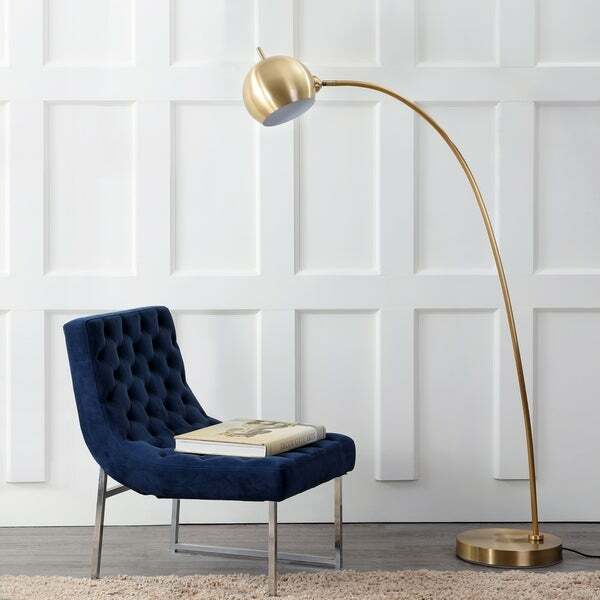 Safavieh Lighting 66-inch Belami Floor Lamp - Gold - 12" x 12" x 66"
An exquisite combination of style and substance, this contemporary floor lamp is a new classic. Designed with a slightly curved arc and posh shade detail, its brilliant polished gold finish casts a radiant glow in any living room. An instant focal point. Dimensions 12.0 In. X 12.0 In. X 66.0 In. Beautiful and affordable. The size is not as imposing as many similar styles. 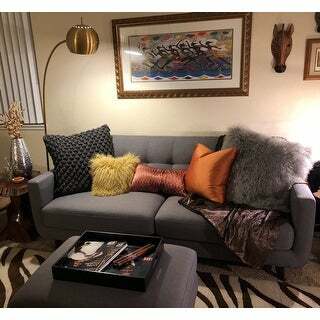 Great for a smaller sectional or living room space as a corner enhancement. The base is extremely heavy and will not tip. The color is a brass gold and looks brilliant with a black and gold scheme. Overalll a nice lamp. The lamp neck is not very easy to screw in tightly to the base (it remains a little loose). Also, the packaging seems very excessive, but maybe that isn't avoidable. But overall a nice looking lamp and a quality one too, particularly for the price. "Where can I find the chair in this photo?"